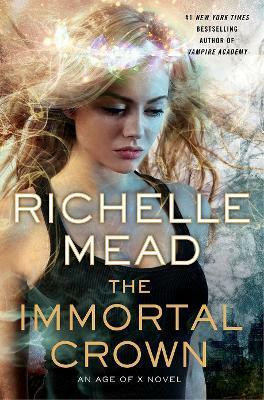 The Immortal Crown is the second novel in the acclaimed Age of X series from New York Times bestselling author, Richelle Mead. Religious investigator Justin March and Mae Koskinen, the beautiful supersoldier assigned to protect him, have been charged with investigating reports of the supernatural and the return of the gods, both inside the Republic of United North America and out. With this highly classified knowledge comes a shocking revelation: not only are the gods vying for human control, but the elect-special humans marked by the divine-are turning against one another in bloody fashion. Meanwhile, Mae-grudgingly posing as Justin's concubine-has a secret mission of her own: finding the illegitimate niece her family smuggled away years ago. But with Justin and Mae resisting the resurgence of the gods in Arcadia, a reporter's connection with someone close to Justin back home threatens to expose their mission-and with it the divine forces the government is determined to keep secret. The Age of X is a new fantasy series from Richelle Mead, containing all the mythological intrigue and relentless action of her bestselling Vampire Academy and Bloodlines series. The Immortal Crown is the second novel in the series following Gameboard of the Gods. Fans of Chloe Neill and Jim Butcher should look this way. Richelle Mead, the New York Times bestselling author of Vampire Academy, lives in Seattle, Washington with her husband and baby. Gameboard of the Gods, the first in the Age of X series and Richelle's first adult novel, is also available from Penguin. Richelle Mead, the New York Times bestselling author of Vampire Academy, lives in Seattle, Washington with her husband and baby. Gameboard of the Gods, the first book in the Age of X series, is also published by Penguin.